Ok, so now I should explain this and the last post. 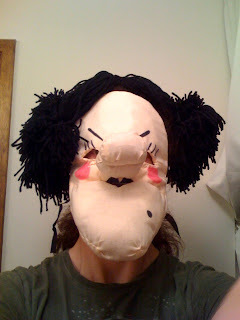 My daughter's kindergarten teacher asked me to make her a mask based on a character in a book called "Miss Nelson is Back". Its about a teacher who is out and the substitute who comes in her place when the kids act up. To see the character look here and click on the back cover. You should see Miss Viola Swamp which is the name of the substitute teacher. The teacher I am making this for is going to use it to "surprise"the kids next week before the end of school. She is planning on re-reading the book to them the day before. Then the next day, her co-teacher will say she's not there and there is a substitute. It should be totally hilarious when she comes out of the bathroom. I exaggerated the mask features and covered it in a pink cloth to make it as cartoonish as possible so its obvious its a character and not a real person. The things you do when you are a mom and an artist. :) Of course, this one was quite fun figuring out how to make the mask.